2008 - 3 lifts were added with the capacity to do Air Conditioning which had not been previously available. 2011 - The facility was moved into a 6000 square foot facility in an effort to continue to stream line the pace of the business to meet the needs of our customers. 2012 - updated computer diagnostic systems for ABS, Air Bags, Tire Pressure Monitors and a Tire mounting and balancing machine was added enabling us to continue to further serve customers. 2013 - has brought us a new coolant flush and transmission flush equipment and a Snap-On Verus scanner which is cutting edge technology. 2013! The latest and greatest announcement is the arrival of an Alignment Machine capabilities. That means that we are truly your one stop shop with the capabilities to meet all your needs. Top of the line equipment to get the Job done right! 2014 we added 2 new lifts for efficiency. 2015 we implemented TPMS Programmers for the new EPA tire technology. 2016 brought further updates to our new and existing hybrid Diesel European Domestic Diagnostic equipment as the International has began to intermingle their designs and technology. 2017 We have a new AC machine that is 99% efficient in recycling capabilities with a close eye to the future changes from r134a to r1234yf. 2018 10 YEARS under current owner! Partnered with Carmax Service repairs and RepairPal USAA insurance as well as the several years of serving the community a AAA Approved Repair Facility. Service on all cars & trucks makes & models. A full 24 months or 24,000 mile warranty to cover 100% parts and labor on all work performed. We have a nationwide warranty on all of our repairs. We offer shuttle service on any repair. We use OEM (original parts) or better. A clean air conditioned waiting room. Call us today at (909) 625-8963 or request an appointment online. We are your complete automotive service facility and your dealer alternative for all makes and models. The inland empire has trusted our auto repair and maintenance skills for 30 years when all that was needed was to be a mechanic. With hybrid technology and significant innovation we have enjoyed the process of updating to our customers needs to the most cutting edge technology. Orr Automotive stays ahead of the curve compared to most businesses in general with simple things like Google Wallet , Apple Pay, and NFC payment processing to our clean shop that is inviting to all. Tune Ups Shocks and Struts Alternators and Starters Axles And Differentials Orr Automotive was started as a 3000 square foot facility with 2 lifts. 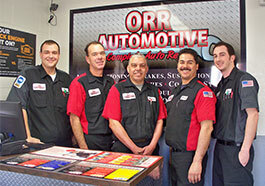 The former owner continued to work for Orr automotive for almost 5 years until the end of 2012. The continued focus of honesty, Integrity, and fairness have remained with a new focus on efficiency. In 2008 3 lifts were added with the capacity to do Air Conditioning which had not been previously available. In 2011 The facility was moved into a 6000 square foot facility in an effort to continue to stream line the pace of the business to meet the needs of our customers. In 2012 updated computer diagnostic systems for ABS, Air Bags, Tire Pressure Monitors and a Tire mounting and balancing machine was added enabling us to continue to further serve customers. 2013 has brought us a new coolant flush and transmission flush equipment and a Snap-On Verus scanner which is cutting edge technology. Alignment capabilities added for further service needs to be met. Top of the line equipment to get the Job done right! 2014 we added 2 new lifts for efficiency. *Alignment must be purchased if not within correct specifications purchase required at regular price $99.99. Tire Balance check is free $8 per regular tire if out of balance purchase is required. Routine car maintenance may be a little boring, but when it comes to your vehicle, wouldn't you rather avoid surprises? Come to us for a scheduled maintenance. To extend the life of your vehicle, have the oil and filter changed every 3,000 miles. Make sure that your vehicle’s antifreeze is flushed and filled. Your car’s shocks and struts should be changed every 50,000 miles, and battery and fluid levels should be checked every month. So, don’t wait until it gets too late! Visit us and get your car checked by a professional auto technician.We are located in the unit right behind Allstate.